about this book: This book, THE FURLITES OF ARORIEL: CURSE OF KORIS is a stand-alone complimentary novel to my THE FURLITES OF ARORIEL series. 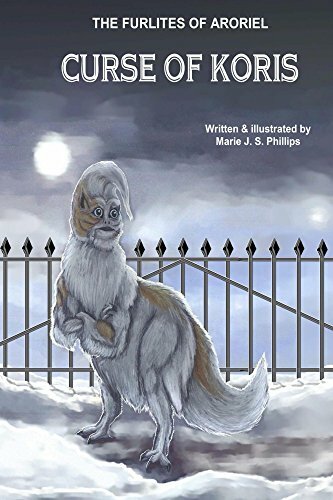 The story follows a young child into adulthood, in a rags to riches tale Furlitian style, showing his battles in dealing with the ramifications of the actions of his long dead ancestor, and his own consequences of conduct. I finished the book in about two years, but only because it is part of a larger world.. The title just came to me easily, since it is about the main character and his feelings about the curse his ancestor levied upon him from the grave. I chose this cover since it shows the main character in one of the scenes in the book. I created the cover with freehand watercolor drawing, and a computer enhanced backdrop. This book came to me easily, as if the character drew his tale out of my head into the computer. I learned from writing this book and several others, that it is almost impossible to get a traditional publisher to even notice a new author. I am not truly new, since I have written stories since grade school, but if publishers do not know you or your agent well, all you see are rejection slips, enough to wall paper two rooms.